Click on the video image above to view our teacher training videos. Welcome! 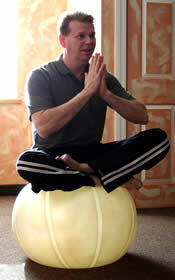 I am Paul Jerard, the Director of Yoga Teacher Training, at Aura Wellness Center, in Attleboro, Massachusetts. Since 1987, I have been teaching classes professionally, in Rhode Island and Massachusetts. Over the years, it has been my privilege to train hundreds of enthusiasts to become internationally certified Yoga teachers and instructors. Due to the repeated success of our Yoga teacher training graduates, Aura Wellness Center has developed a Yoga certification program, which teaches you everything you need to know about how to safely instruct classes, constantly improve your skills, and run a successful teaching practice. Additionally, you can learn everything you need to become a Yoga teacher from home and at your own pace. It is called the “Yoga Teacher Training Camp-in-a-Box” for home study teacher certification. With the praise we received for developing the original course, Aura Wellness Center has been inspired to create a full collection of affordable home study courses for popular and important instructor specialist courses, such as Restorative, Power, Kids, Chair, Prenatal and Postnatal, 500-Hour Yoga Instructor Training, Vinyasa, Meditation, Yogic Anatomy, and more. Equally important, Aura Wellness Center has developed complete courses and tools to help instructors run successful teaching businesses. After all, it is one thing to devote yourself to doing what you love; but it is quite another to be able to support yourself comfortably, and securely, while doing it. You will not learn these skills at a typical retreat or Yoga teacher training intensive. Whether you are an experienced teacher, needing to re-certify, or a student who is looking to become a Yoga instructor – you have come to the right place. Our no-cost teacher community will help you find what you are looking for. Read more about how, and why, I developed this program, or visit our courses and products page to learn more about the extraordinary value of these courses. If you are uncertain about Yoga teacher certification online, read what some of our hundreds of happy graduates have to say; or, join our no-cost teacher community and start learning today! Over time, we have learned from our graduates that our Yoga instructor training program truly speaks for itself – once people have a chance to explore this site and interact with other members. Please feel free to browse our site, use our resources, improve your teaching skills, and join our community, to find out for yourself about the advantages and benefits of home study Yoga teacher training, while you discover and share with other instructors. Enjoy your visit, and good luck with your dreams. I sincerely hope to see you participate in our Yoga teacher training forums, which are full of information and research from many Yoga instructors around the world. Although there is much to discover by visiting our Yoga teacher training blogs and forums, many of our successful graduates have mentioned that their favorite resource is our video archives. If you are looking for a resource that addresses teacher issues, this is it. Within the video archives are over nine hours of lectures and demonstrations for many different teaching situations. The subjects vary from how to assist your students during Sun Salutations to asana modifications for students who have pre-existing injuries. Other points of interest are how to use props, how to safely challenge flexible students, how to practice mudras, and how to perform pranayama techniques. To visit the Yoga instructor training video archives, please click here. Watch for our new and improved website coming soon!